The full article with screenshots was originally posted on the game design blog Significant-Bits. Unfortunately Gamasutra no longer allows hotlinking of non-https images, so only the charts are included here. Having grown up with JRPGs, it's somewhat surprising how rarely I play them these days. That desire for a wondrous epic is still there, but pursuing new titles usually results in a feeling of slogging through manufactured bloat. The introductory segments are often filled with painfully-gated progression, overenthusiastic tutorials, and a juvenile narrative. In the limited instances where the opening is great, the overall game-loop tends to sputter out into protracted tedium. In either case, I quickly lose interest. This general reaction to modern JPRGs must have a lot to do with growing up and having less free time, a lower tolerance for anime tropes, and no emotional attachment to the new series. But hasn't the genre improved overall? Weren't the older games just grind-fests burdened with copious amounts of random battles? To help answer that question, I thought it would be interesting to quantify some of the less subjectives elements of JRPGs, starting with the 4th generation of consoles. 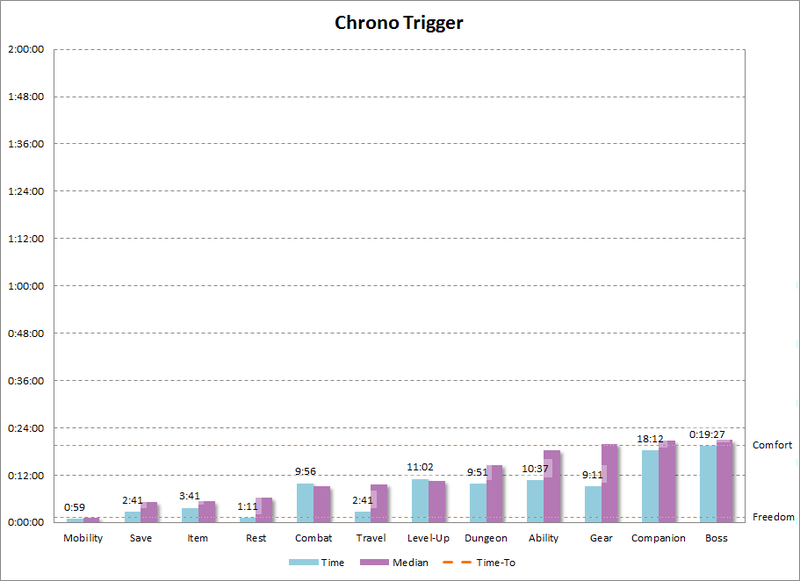 My approach was to replay the first 2 hours of the more renowned JRPGs released in North America and measure the amount of time it took to reach various gameplay-milestones in each one. To avoid the more contentious titles occasionally placed under the JRPG umbrealla, I only included games with multiple controllable party members, a turn-based battle system, and a character-driven narrative. Despite having played many of these games in the past, I only had a vague recollection of most and attempted to emulate a first-time, completionist experience. I talked to every NPC, entered every building, brought up every menu, and skipped no cutscenes or dialogue. I did, however, increase text-display and walking speeds wherever possible. My main goal was to measure two elements, Time to Freedom (TTF), and Time to Comfort (TTC). I define Time to Freedom as the first time the player gets to interact with the game in any way beyond simply advancing cutscenes, and Time to Comfort as the amount of time it takes to experience all applicable gameplay-milestones within a 2 hour limit. These two metrics are meant to show how quickly the player can start experimenting with the game, and how long it takes to experience its main mechanics and gain a certain sense of mastery over them. Additionally, I noted each game's Freedom to Comfort (FTC), defined as the difference between TTC and TTF. Mobility - first time the player gains control over their avatar. Save - first time the player is allowed to save their game. If an auto-save feature with an indicator is included, I will attempt to note its first use. Item - first time the player manually obtains a usable item. Rest - first time the player can manually and repeatedly recover all HP/MP/etc., typically by staying at an inn. Combat - first time the player enters an interactive battle. Travel - first time the player gains access to the overworld map or reaches a hub area that can transition to multiple other nodes. Level-Up - first time a character's statistic increases, typically through leveling up. Dungeon - first time the player enters a geographically-distinct area that focuses on traversal and combat. Ability - first time a character gains a new spell or ability (meant to be used in or out of combat). Gear - first time the player manually obtains an equipment upgrade. Companion - first time the player encounters a character who joins the party and can participate in battles, level up, etc. (i.e., not a temporary companion). Boss - first time the player encounters a unique and powerful enemy. A few other elements such as vehicles and minigames were not included as they were either not common enough or typically appeared in the mid to late stages of a game. In addition, I provided a bit of context for each title, highlighting what made it stand out from other JRPGs, and contributed a bit of analysis on the milestone results. Finally, I am limiting each console cycle to 10 games and sorting them chronologically by original release date (usually in Japan) in order to give a better idea of the genre's progression. My first JRPG and a landmark title in the genre. It injected a bit of dynamism to turn-based combat via the Active Time Battle system, and managed to take a narrative step forward by creating plot-related story arcs for all party members. It's also known for having a fairly brisk pace, partially credited to lots of content being cut. Further cuts were made to the North American release removing various items and characters skills, but even this eroded version was ultimately deemed as too complex by SquareSoft. Consequently this led to the development of the much-maligned Final Fantasy: Mystic Quest in order to introduce JRPGs to the West. 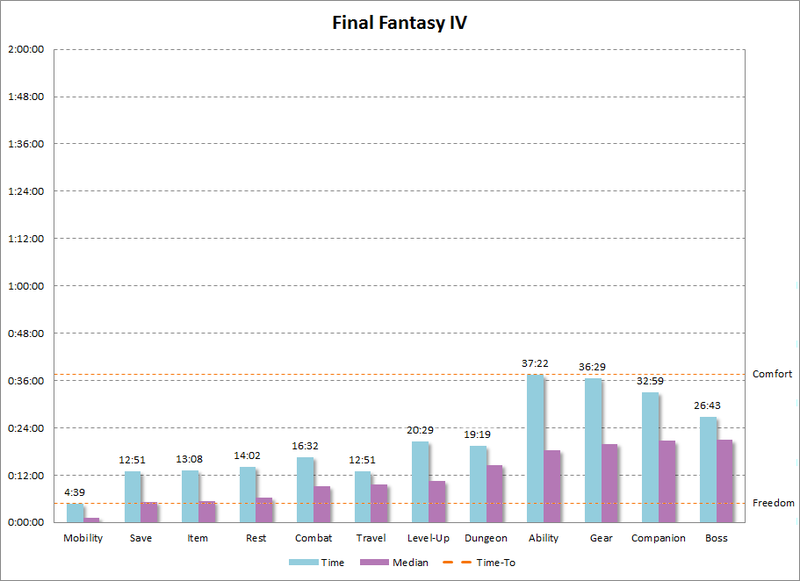 Mystic Quest fared even worse, but eventually Final Fantasy IV gained enough popularity to warrant various re-releases, a remake, and even an episodic (albeit not as fondly received) sequel. I remembered Final Fantasy IV's intro as rather long, but apparently it didn't even last 5 minutes. Part of this might be the fact that dialogue popups (unusually located at the top of the screen, not the bottom) appear without any delays, and multiple characters' lines can be displayed in the box at one time. The TTF is still a bit deceptive as once the mobility milestone is hit, the player has to sit through various cutscenes and expository sequences before being deposited on the overworld map. 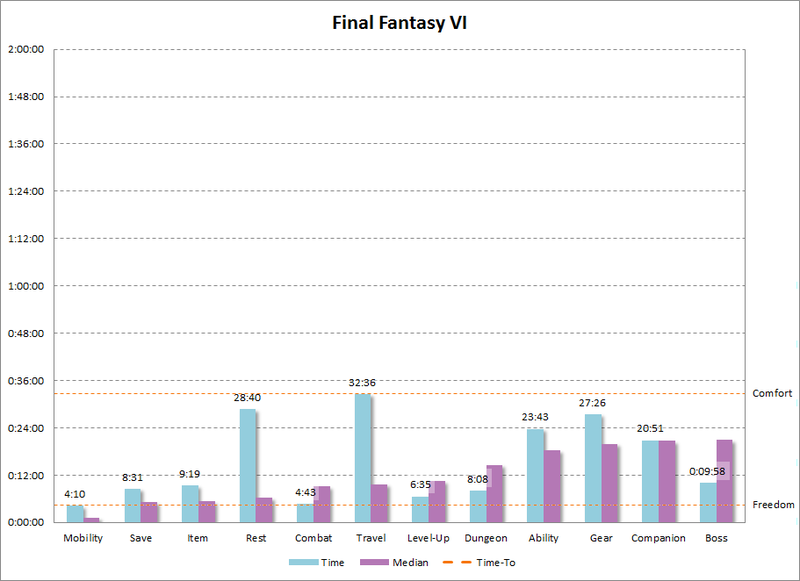 Once the restraints are fully off, FFIV hits an excellent pace in terms of both gameplay and narrative. Random battles are fairly frequent, but running away is always an option -- with the additional risk of losing money -- and level-grinding is not required. Party members come and go very quickly, and the plot continuously unfolds at each turn. The only outlier is the first equipment upgrade that comes unusually late as the weapons/armour shop is closed in the first town, and there's no gear to collect in the first dungeon. Hidden paths and out-of-the-way areas on the borders of maps have always been present in JRPGs, but they reached a crescendo in FF IV. They continued to pop up in JRPGs afterwards, but never quite to the same extent. As with all Final Fantasy games, the battle system is more complex than most other JRPGS: back/front row formations affect damage and defense attributes as well as weapon efficiency (and are flipped when an enemy group surprise-attacks the party), elemental resistances vary all the way to some attacks actually healing instead of damaging, items not only serve as restoratives and a way buff/debuff but also duplicate spell functionality, spells can be toggled to target all enemies/allies instead of single individuals, character classes come with unique abilities such as stealing items from opponents or temporarily summoning giant monsters, unique reactions are coded into certain enemies such as life-reviving items/spells insta-killing undead creatures, etc. There are no random battles on the world-map when riding in a vehicle or on a Chocobo, speeding up some of the exploration and backtracking. I was a little surprised to see the original Lunar appear so early on the list, but in retrospect it makes sense. By 1991, various "multimedia" heavy games such as Cosmic Fantasy were coming out on Japanese PCs and the CD-ROM² System. Lunar: TSS was the Mega CD's flagship JRPG, and its North American publisher, Working Designs, created a port known for a fair amount of changes. Extra humour and pop culture references were sprinkled in, and the packaging itself included various extras to position it as a premium title. 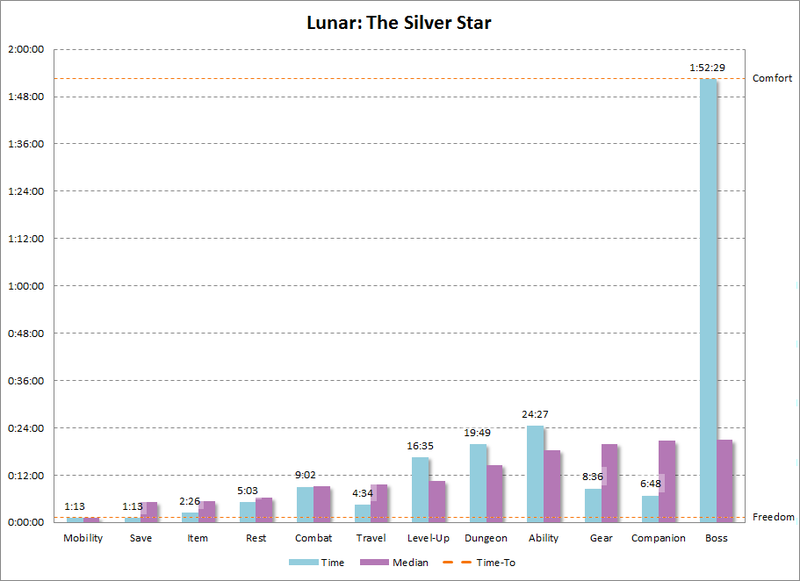 The Silver Star was successful enough to turn Lunar into a franchise, spawning a sequel, various spinoffs, and multiple ports and remakes. Despite the multimedia experience being a large selling point, Lunar: TSS started off fairly quickly, mainly due to its voiced and animated intro playing before the title screen. From there, it took very little time to get some items, a few companions, and go out exploring. Menus and dialogues displayed instantly so there were no unnecessary delays, although movement was a bit tricky as the game auto-pathed whenever the party ran into a collidable obstacle. Keeping a direction pressed down made the party hug the wall and keep going, making it at times difficult to properly line up with interactive elements such as NPCs and treasure chests, especially when they were close together. Combat included movement and attack animations so it was a bit slower than its contemporaries, but it didn't drag on with overly involved spell sequences. Random encounters were truly random in terms of frequency, but the overworld was littered with HP/MP restoring statues so I was never in any real danger. 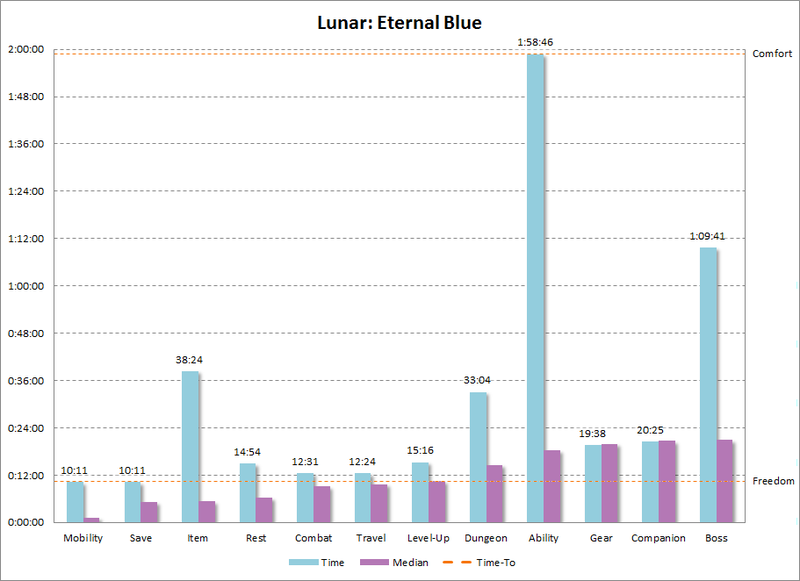 Lunar: TSS' only outlier was its first boss battle, which came fairly late into the game. It was also quite difficult and required a bit of grinding as the boss was only susceptible to magic and the protagonist unlocked his spell-potential right before the boss' dungeon. The remakes of the game changed this up quite a bit, adding more boss battles and altering the narrative-driven party composition. Extra XP is awarded for completing story segments, which is a nice CRPG-like touch that never makes it to any of the sequels/remakes. Another small CRPG-like element is that each character has their own limited inventory, which includes all the equipment items. This means that restoratives need to be placed here in order to use them in combat. The AI command in combat usually makes a character attack the closest enemy, and each character has two toggles for whether AI can also include casting magic and using items. However, it needs to be selected for each character individually once per combat round, so it's not quite an auto-battle toggle. There's actually a hidden checkpoint system in the game which I discovered upon dying to the first boss. The game didn't restart me in the battle, or even the boss' dungeon, but rather in the town above it, so I'm not sure what governs its behaviour. Either way, it was still a nice, forward-thinking element that became much more prevalent in future games. Phantasy Star was Sega's main JRPG for their other console, the Mega Drive, and The End of the Millenium was the final entry in the series. Despite not relying on a CD-ROM for storage, it featured lots of animated characters and enemies, and copious amounts of pixel art stills for its manga-esque cinematic sequences. 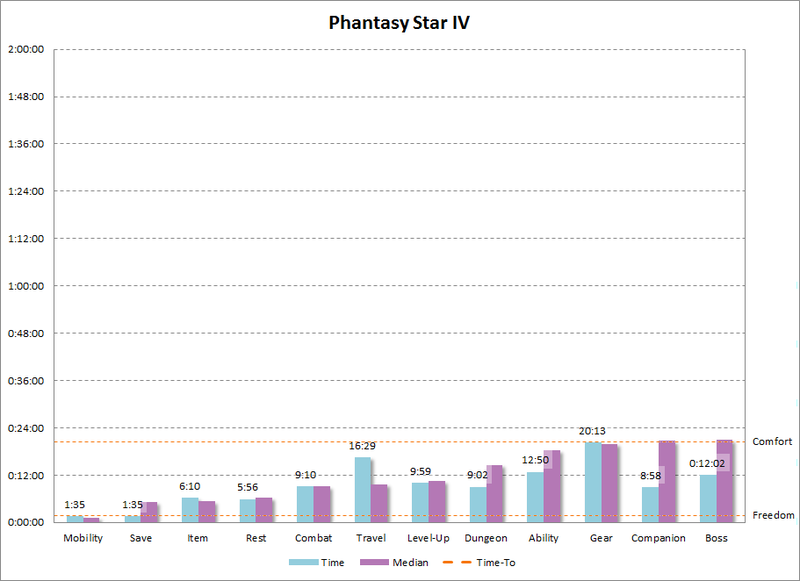 The high production values and epic scope did a lot to wash away the negative reception of Phantasy Star III, but it wasn't enough to keep the series going. The Phantasy Star IP was eventually used again, but this time for a series of real-time, squad-based online games rather than a traditional JRPG. PS IV's dialogues were printed out one letter at a time in a text box that was only two lines high, its menus popped up one above the other and all closed individually when dismissed, and much of the environment could be investigated for flavour-text that bogged down a completionist playthrough. Despite all these elements, PS IV was the second fastest game to hit all the milestones, and it could've easily taken first spot if I had played the games slightly differently. The intro was brisk and started the player off in a town with an inn, an item shop, and a short dungeon with a boss at the end. Saving could be done anywhere, and another character joined the cast before the first dungeon was entered. Combat was filled with animations, but there was no need for movement like in Lunar and all attacks played out very quickly. In addition, there was an option to use "macros" in battles, pre-defined actions for each character that played out automatically. Once the local problems were dealt with, the overworld map became available and a trek to a nearby optional town provided gear upgrades. Random battles seemed more rare on the overworld map than in dungeons, and they never happened in quick succession. Combined with a quick walking speed, PS IV feels like a very rapid JRPG, and my milestone measurements seemed to back that up. The main menu has a "mumbl" option that has a party member speak a line or two about the current goals of the party. This sort in-game reminder for what to do next is common these days, but was quite forward-thinking at the time. In addition to spells, dubbed "techniques," some characters also possess "skills" that don't rely on a points system but instead can be used a limited amount of times before resting is required to refill them. Secret combination attacks are executed when using certain skills/techniques in a single combat round, but these rely on a pretty strict action-order that is often outside the player's control. Movement has some auto-pathing like in Lunar, but unlike that game, it only activates when bumping against the corners of collidable objects. Unusual for top-down JPRGs of the era, entering buildings tends to show a "zoomed-in" version of their surroundings instead of just a black colour fill. One of most renowned JPRGs of all time, Final Fantasy VI continues to vie for the top spot in the series and the console generation as as whole. Unlike Lunar and Phantasy Star, Final Fantasy continued to avoid combat animations and pixel art stills for its presentation, instead relying on complex backdrops, larger sprites with a fair amount of custom animations, and all sorts of Mode 7 trickery. The complexity of the narrative and gameplay also increased to levels much beyond its contemporaries, with a large cast of characters, loads of optional content, and numerous cinematic set-pieces. FF VI continued the new trend of starting off with a short dungeon crawl that covers a variety of gameplay elements without overwhelming the player. The first segment introduced movement, combat, saving, leveling up, items (the first one I got was actually a random drop following a battle), and ended with a relatively easy boss fight. Once the boss was defeated, the game switched to a different playable character, a motif unique to FF VI as the game deemphasized the singular protagonist. The overall experience was also a lot more scripted than other JRPGs as there wasn't as hard a line between cutscene and freedom; some of the enemies were present on the map and quickly yelled out before attacking, the camera briefly panned to show forces pursuing the player, party members were given short barks in combat to hint at a tactic against the boss, etc. A party-splitting minigame was up next with a band of Moogles forming three distinct player-groups. Switching between these could be used to cut off slowly moving enemy parties, while the combat itself previewed various weapon attacks as the Moogles were all equipped with a variery of armaments. This sequence also provided an early gear upgrade as I managed to use the Steal ability to obtain a MithrilKnife. After the starting characters both joined up, the overworld map opened up (with a handy restorative bucket nearby) and the game-proper began. The intro has the party storming a snowy town in Steampunk mechs. A neat element of this is that various parts of the town are organically inaccessible to the player due to the bulky frame of the mechs. In addition to surprising the enemy or being attacked from the back, FF VI adds two more battle orientations: having the enemy surrounded, and being pincered attacked where each character alternates which direction they're facing. An "Optimum" option is present on the equip menu that attempts to suit up the current character with the highest stat-boosting gear currently available. Conveniently, this does not include artefacts with custom behaviour that might not include stat boosts; those are segregated into their own "Relic" menu. Nintendo's own shot at an in-house JRPG was typically atypical. Instead of a vaguely medieval setting with the occasional firearm or spaceship, Earthbound elected for modern-day quirkiness. The game was like a funhouse mirror version of America steeped in references to Western media that were woefully outdated for its target audience, e.g., the Beatles and Blues Brothers, 50's sci-fi flicks, the Little Rascals, etc. The premise was a bit of a hard sale, and the odd marketing campaign didn't seem to help, but eventually Earthbound gained a fan base that -- while not the largest -- has to be one of most dedicated out there. 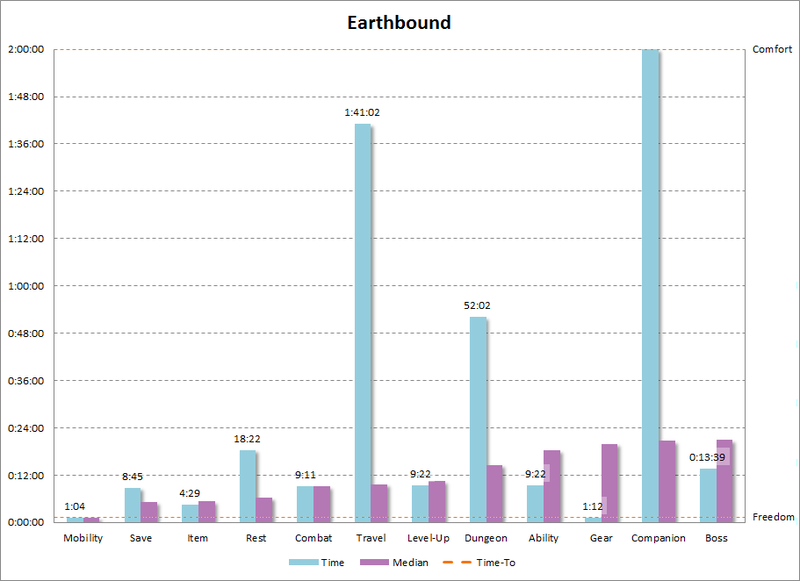 Earthbound was the first and only title on the list not to hit all the gameplay milestones within the 2 hour limit. It started off quite briskly, coming in at or below the median for TTF, item and equipment acquisition, combat, leveling up, and gaining a new ability. However, overall progression had a slower pace than its contemporaries. Text in Earthbound is printed out in small comic book balloons, and while it was generally fun and charming, there was also quite a bit of it. Combat used a lot of printed descriptions as well, and the higher frequency for missing attacks (both by the player and the enemies) extended the average battle duration. Walking speed was also fairly slow, and combined with large maps filled with NPCs, exploration had a bit of a languid feel to it. It was quite fitting for the happy-go-lucky setting, but it did put the game on the slower side of things. Enemies were visible on the map and could be largely avoided -- and they even started running away from me once I reached a high enough level -- so replaying the game could go much faster if one simply made a beeline for the next plot point. The only caveat here is that I actually had to do some grinding to defeat the second boss; it wasn't strictly necessary, but I died on my first attempt and didn't want to rely on luck to continue. There are lots of funky sound effects for combat, menu navigation, etc., that help to give off a quirky vibe. Part of the game's unique look is due to its cabinet projection for regular maps and a charming little diorama-esque view for indoor locations. Enemies can be surprised by running into them from behind, and they can get a free combat round as well if they pursue and catch up to the protagonist. When a battle is initiated, other enemies that were visible on-screen can also rush in to join the fight before transitioning to the combat screen. The rolling-metre system in combat only actualizes damage when the HP counter hits its target value. While the metre scrolls quite quickly. making it at best a minor factor, there was at least once occasion where I managed to defeat an opponent following what should've been a lethal blow to the protagonist. Following a fight, the protagonist briefly flashes to indicate invincibility. While in this mode combat cannot be initiated, giving enough time to access the menu and prepare for any subsequent battles. A rarity amongst JRPGs: a direct sequel that retains the same setting and links to the previous game's events and characters. Eternal Blue also upped the ante on the multimedia content with more cinematics and voiced content, and much like The Silver Star, received various remake-ports. Despite this, it was the last main entry in the series and only received side-story sequels of dubious quality. In many ways, Lunar: EB was a preview of the next generation's JRPGs. There was more text -- with NPCs often rambling on for a while, and having different things to say a second time around or when the plot advanced -- more cinematics, more voice overs, etc., and a lot of it unskipable. The game began with a lengthy intro that was more than twice as long as any other game on the list. Things picked up right after, though, with the ability to save and rest, access to the overworld map, random combat, a gear upgrade, and a new companion. This whole segment would've gone even faster if it wasn't for one relatively big problem: loading times. Every instance of combat, which was already on the slower side, was preceded and followed by a noticeable load time. The unusually low success rate for running away from battles exacerbated this issue. Since the party started off with a fair amount of items, it actually took a while to reach the first dungeon and obtain new ones. Following some more lengthy cinematics and traversal, the first boss appeared leaving only one more milestone on the list: gaining a new ability. In Lunar: EB, there actually is no automatic unlocking of any new spells. Instead, magic experience points are gained following each battle (which in the North American port are also used to save), and these are used to upgrade individual abilities. I started off by strengthening a few characters' spells, but refrained from using MXP until I got close to the 2 hour limit. At that point, I focused on upgrading the protagonists abilities, and had just enough points to morph one of the old spells into a new one, and gain a brand new spell as well. More so than any other JRPG of the era, Lunar: EB's narrative is character driven. The plot focuses not so much on saving the world as helping out a mysterious character the protagonist encounters while avoiding an NPC that pursues them. The world saving element is still there, but more as a backdrop for the characters' individual goals. Enemies often assume certain stances in between combat rounds that work as tells for what ability they'll do when their turn comes up. This adds an extra wrinkle to combat, hinting at which foes should be focused on by the party. e.g., the Sand Sharks do more damage and target an area when their heads are sticking out of the sand, Althena's Guards block all basic physical damage when their shields are up, etc. There's some interesting interactivity between some of enemy groups that add further consideration to combat, e.g., Bandage Boys all perish when their Mummy leader is destroyed, while a pointing Cave Rat will cause all other rats to rush and attack a single character. Unlike the original Lunar, AI is a proper auto-battle toggle that lasts round after round until manually turned off. In addition, the game has three "tactic" slots that work like macros in PS IV and allow the player to assign specific commands to be executed for one round. Party HP/MP appear in a different outline/fill colour based on whether they're at maximum values, below them, or close to running out. Neverland is best known for its Rune Factory series, but Lufia II is by far my favourite game from the developer. It also filled a bit of a niche as Dragon Quest titles never made it out to the West during the 4th generation and the two series shared many similarities: the art style, the combat, the almost-episodic nature to the narrative, the gambling minigames, churches being used for saving and curing ailments, the ability to recruit certain monsters into the party, etc. However, Lufia II built on top of those elements with a bit of a kitchen-sink approach, adding a roguelike step-turn system to its Zelda-inspired dungeons, providing equipment that granted unique abilities, and even included an optional but giant randomly-generated maze. 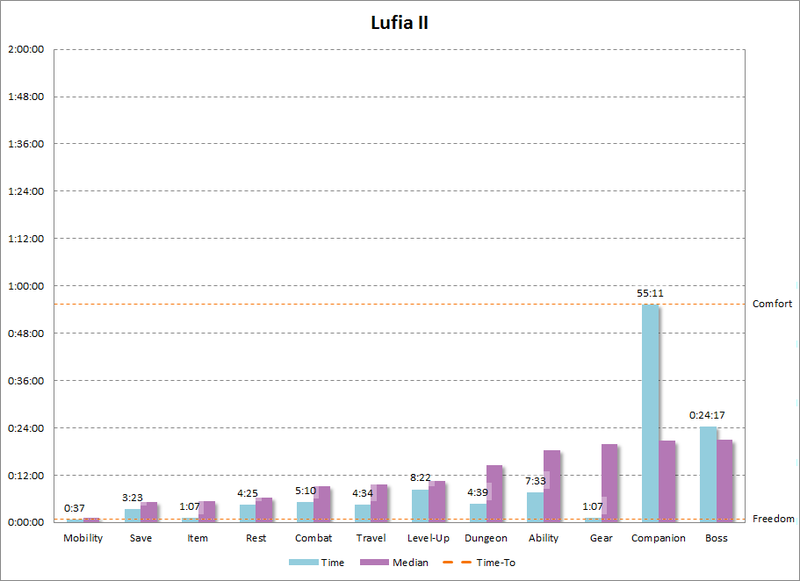 Aside from the last two gameplay milestones, Lufia II was the quickest game to get going. The protagonist walked into a shop, exchanged a few words with a girl, and we were off! Text was shown in comic book balloons -- with characters' inner thoughts displayed using a different border and notch -- but plenty of it could fit in these balloons as the number of lines adjusted to the dialogue itself. The text display speed was also set to fastest by default; the only time I recall ever seeing that in a JRPG. Walking speed was quick as well, and enemies could be seen and often avoided in dungeons (random encounters existed on the overworld map, but didn't happen too). The starting town provided items, equipment, and spells for purchase, as well as an inn. Stepping outside brought me to the overworld map, and an introductory dungeon just to the south granted the first level up. It took a few more towns and dungeons to fight the first boss and gain the first companion, but Lufia II generally progressed at a very fast pace. The dungeons are very compartmentalized, and despite a lot of reused mechanics, each room feels like a unique puzzle: drop through the floor in the right place to hit a switch on the floor below, stun an enemy with an arrow to keep it positioned over a trigger that opens the exit, hit the musical chime columns with the right attack to unlock the next room, etc. It's a lot of complexity, but areas with new mechanics often have notes pinned to the wall that explain the new gameplay. Pressing "X" when highlighting a spell or item brings up a short description along with any special attributes. These sorts of interface niceties are fairly common in Lufia II, e.g., there are options for equipping the strongest gear available removing all items, toggling spell-targeting to all, instantly buying and equipping gear in stores or just purchasing it, etc. Many pieces of equipment provide additional abilities such as elemental attacks and healing. These rely on an IP metre, a third resource for all characters that fills up as they're damaged. Enemies have a small chance of dropping "rocks," equipable items that somewhat represent the essence of the creature and provide new IP abilities in addition to significant stat boosts. Recruitable monsters can't be controlled or healed in combat. However, they do automatically recover after every encounter and level up along with the party. In addition, monsters can be fed items and equipment to "evolve" into a new class, but this takes a long while and filling the evolution metre works best when the monsters is given their requested treat. This changes after most feedings and provides a further use for old weapons and armour (so much so that I rarely had enough gold to purchase all the available spells and gear). SquareSoft and Enix were the two largest JRPG competitors during the 4th generation, so it was quite a boon for SquareSoft to welcome Yuji Horri (Dragon Quest's creator who was apparently freelancing at the time) and Akira Toriyama (the concept artist for Dragon Quest and creator of Dragon Ball) into the fold. Expectations for the Dream Team's project were quite high, but considering Chrono Trigger is often cited as the best JRPG of all time, it's safe to say they were more than met. In some ways, Chrono Trigger felt like the streamlined JRPG that FF: Mystic Quest always wanted to be. The party was limited to 3 characters, the overworld map was visually compressed and had no random encounters, equipment was reduced to 4 slots, only restorative and stat-upgrading items were available, and the dungeons tended to be fairly small. Despite this, the game didn't start railroaded to an excessively linear path. Chrono Trigger's short opening let the player instantly visit two different towns, rest & save, purchase items and equipment, visit a small forest to fight enemies and level up, and partake in various minigames. To move the plot forward, a new companion was met at the fair, and one optional boss battle later all the gameplay milestones were hit in just under 20 minutes; perhaps the streamlining of the game also helped to remove a lot of common filler? Holding the "cancel" button causes the character to run, something that became a common convention for JRPGs. Enemies are not only visible on maps, but also fought there instead of transitioning to a separate screen. Like in Lunar, abilities also include certain specifications for which enemies or party members they can target, but there's still no manual movement in combat so it plays out at a quick pace. Enemies don't just stand or randomly wander around the environment: some can be caught sleeping, others hide in bushes and won't appear unless their sanctuary is investigated, while others still are busy playing games or patrolling a specific area. Items are can be hidden in pots or other environmental objects, but these are usually accompanied by a sparkle effect that makes their presence quite obvious. Text boxes are not modal so it's possible to simply walk away from talking NPCs instead of clicking through their whole speech. The text box can also be toggled on the fly to either appear at the top or bottom of the screen. Special combination attacks are selected from the menu when all the necessary characters are able to act. This removes the guessing work in discovering them like in PS IV, and prevents them from not working due to timing issues. Chrono Trigger dubbed the concept of a New Game+ which was required to obtain all of the game's various endings. Despite the Mother series' relative success, Nintendo reached out to SquareSoft to make a JRPG starring their flagship mascot (perhaps wanting to avoid further conflict with Miyamoto who scoffed at using CG graphics following Donkey Kong Country's success). The relationship between the two companies soon soured, but Super Mario RPG itself was both a critical and commercial hit, and managed to morph into two individual sub-series for Nintendo. Just like FF VI, Super Mario RPG started off with a short, railroaded dungeon that set up the main premise of the game while letting the player get comfortable with basic combat and exploration. A few tutorials then followed introducing resting, saving, items, and overworld exploration; further milestones were a bit more spread out. 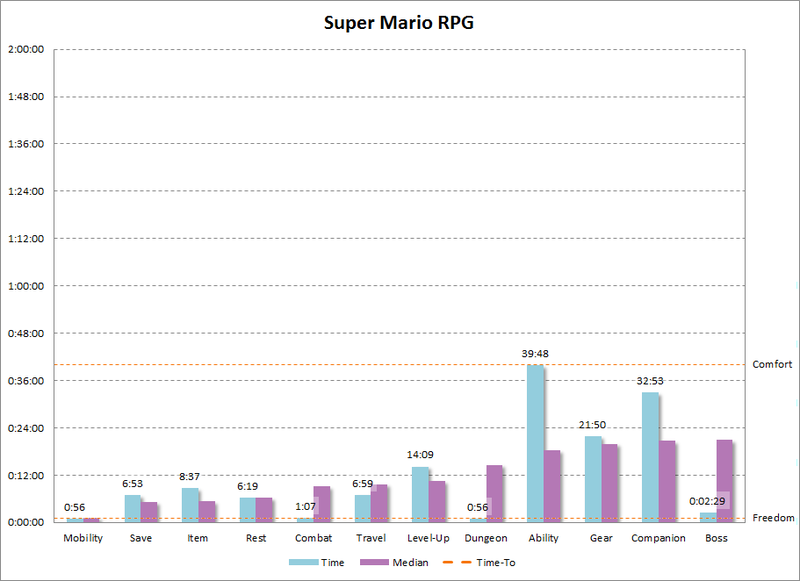 Perhaps wanting to avoid overwhelming newcomers to the genre, all numerics in Super Mario RPG were on the smaller side. This included max character levels, which were restricted to 30 rather than the more typical 99. This meant that leveling up, and by extension gaining new abilities, was a bit more spread out. Despite this, Super Mario RPG still hit all its milestones in well under 45 minutes. There's a lot of charm and humour in the game, including Mario being the silent protagonist who pantomimes events via custom animations and temporary transformations into enemies to get his point across. The isometric maps require some rudimentary platforming and make good use of interactive elements common to Mario platformers. Enemies are visible on maps and there's a lot of scripted behaviour to them: Goombas rush from behind bushes to ambush the player, Koopa Paratroopas fly around with a kidnapped Toad, K-9s swarm the screen for easy dispatching when a Super Star is collected, etc. The party shares a Flower Points pool for all ability use. Timed button presses allow the player to power up attacks and abilities, and reduce incoming damage. The timing for these isn't always obvious, but all ability descriptions provide a hint as to when the appropriate button should be pressed. Combat menus are mapped to the four face buttons, creating a slightly more reactive experience when choosing to attack, use abilities, use items, or defend/run away. Enemies typically drop coins when defeated, but occasionally they'll relinquish an HP-restoring item or provide the attacking character with an extra turn. Despite its humble roots, Pokémon went on to become the most successful JRPG series of all time. In fact, a whole separate company was spun out to manage the IP, and it's still hailed as the highest grossing media franchise in the world beating out such juggernauts as Star Wars, Mickey Mouse, Harry Potter, and the entire Marvel Cinematic Universe. A trend with the series has always been to split each entry into two slightly different titles, and eventually put out a combined version. 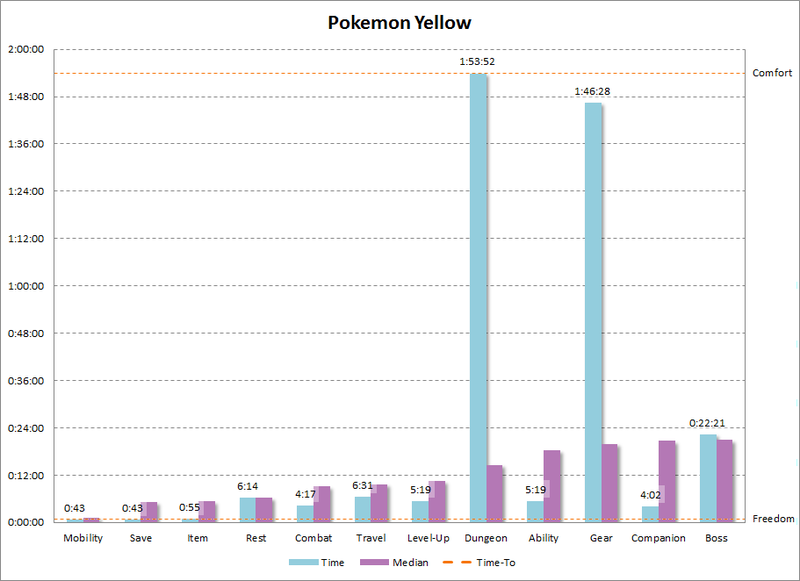 That's what I decided to cover here: Pokémon Yellow, the merging of the original Red/Green releases. Pokémon started off very quickly, coming in at or below the median for mobility, resting & saving, obtaining an item, combat, traveling, leveling up, gaining a new ability, and having a companion join the party. However, Pokémon didn't map onto all these milestones as directly as other JPRGs. I considered the first companion to be the first Pokémon I was given. These pocket-monsters can be swapped in and out at will and can't be equipped with any gear, so they don't function quite like your typical party member. The protagonist has no equipment either, so I waited until the first stat-boosting badge was obtained before toggling that milestone. The game also lacked typical bosses, so in this category I substituted in the first encounter with a Pokémon Trainer who had multiple creatures to dispatch. However, because their minions are not completely unique and there are so many Pokémon Trainers in the game, it might be more accurate to describe them as minibosses. It could also be argued that the wilderness areas between towns all constitute individual dungeons. They're certainly deliberate from a level design point of view, and contain their own groups of Pokémon, Pokémon Trainers, and treasures. The main reason I didn't count them as dungeons, though, was that much like Super Mario RPG, they served as common transitions between distinct locations rather than being unique destinations in and of themselves. The "Gotta catch 'em all!" slogan of Pokémon also led to an interesting dynamic when it came to grinding. An experienced player can easily capture and upgrade the Pokémon most suited for exploiting the weaknesses of the upcoming enemies and bosses. However, a new player or a completionist will spend vast amounts of time trying to encounter, capture, and level up all the available creatures, slowing down overall progression quite a bit. Despite not being as action oriented as Super Mario RPG, general traversal is still more interesting than in a typical JRPG. One-way ledges make backtracking easier, random battles can be avoided by limited exposure to tall grasses, and careful navigation can skip past Pokémon Trainers who rush forward to fight if the player walks in front of them. Pokémon don't use MP for their abilities, instead relying on Power Points that work similarly to skills in PS IV. Each ability costs one PP to use, but unlike PS IV, these are usually quite numerous, e.g., 30-40 uses. Each Pokémon is limited to 4 abilities, but can learn many more. When a Pokémon obtains a fifth ability via leveling up or using a TM item, the player can decide to not learn it or replace one of the old abilities with the new one. At certain level ups -- or through the use of special items or trading -- Pokémon can evolve into new forms, complete with a new spriteset and a different progression path for statistics and abilities. The Pokémon themselves are well integrated into the game world, often appearing in people's houses and generally being intertwined with the setting rather than being a standalone element within it. 10 games make for an extremely small sample size, but timing these titles still proved quite eye-opening. I generally suspected that combat, items, and equipment milestones would come first, followed by overworld travel, resting, and saving. Once this initial loop was established -- giving the player freedom to upgrade and recover as needed -- I figured the next steps would involve delving into a dungeon and fighting the first boss. Some plot exposition would then follow, a new companion would join the group, and the old character(s) would learn a few new tricks in combat. Things didn't quite go that way. Resting & Saving was already an early-game staple, while most titles either began in a dungeon where a boss awaited, or took a long way to build up to those encounters. Acquisition of equipment was something I just flat out got wrong; getting new gear was a lengthy process, often coming in after new abilities were obtained. The most shocking aspect of the timing, though, was the TTF itself. I thought that some openings would last up to 30 minutes, but the longest one wasn't even half of that. In fact, 9 games started off in under 5 minutes, with most only taking a minute or so to get going. Part of the reason for this was an interesting trend to play an opening cinematic before the title screen, or via an attract-mode. These would often set up the setting itself, leaving only character introductions once the game itself began. Grinding proved to be mostly a non-issue, at least in the first 2 hours of each game. Even more surprisingly, random encounters themselves were already being diminished. Not only was combat not as obnoxiously frequent as I had feared, many games were either showing enemies on the maps or experimenting with the approach, e.g., the Pokémon Trainers in Pokémon Yellow and the guards aboard Leo's ship in Lunar: Eternal Blue. Another unexpected element was the proliferation of minigames. I thought these mostly started appearing 5th generation, but they often popped up in this one as well, e.g., the slots in Lufia II, the carnival games in Chrono Trigger, the collection-races of Super Mario RPG, etc. Considering combat wasn't quite as unavoidable as some might think, I expect things to slow down a bit in the next console generation. There will be more cinematics, more voice overs, and more text; as odd as it might sound, a game's script was one of the many things limited by cartridge size. I already have a rough list of which JRPGs to cover next, but feel free to let me know if you have any suggestions!